Over the course of 3.5 years, Transworld has produced over 45 papers, a survey of US and EU political, social and economic elites, and a Delphi exercise involving up to 100 experts. 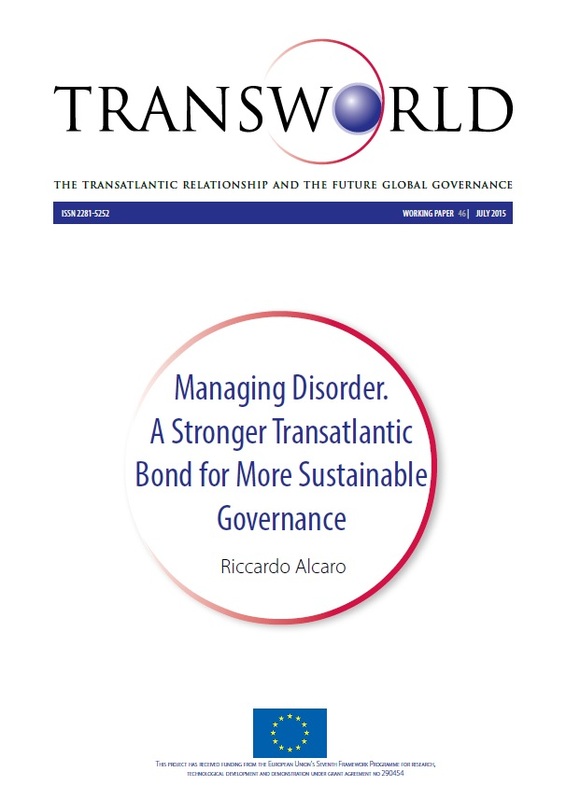 Drawing from these various lines of research, Transworld coordinator Riccardo Alcaro has authored a paper in which he sets forth an agenda for transatlantic cooperation to strengthen global and regional governance. Governance of global and regional challenges has become an increasingly difficult task. The emergence of new protagonists on the world stage has complicated efforts to achieve the international consensus needed to address global imbalances, fight climate change, and tackle new threats. Tensions between great powers have risen, regional crises have deteriorated, and non-state actors such as jihadist groups and criminal organizations have proliferated. Reflecting these systemic changes, the ability of the United States and its allies in Europe to shape governance structures has dwindled. Adding to these difficulties, political polarization has often resulted in gridlock within the United States, while the European Union is mired in a severe crisis of confidence. Nevertheless, the US-European partnership remains indispensable to effectively address some of the most pressing regional and global challenges. The United States and European Union countries retain still considerable – indeed massive – resources. Critically, they share normative and strategic interests in a broad range of issues, from restoring security to Europe’s troubled neighbourhood to addressing challenges such as global trade and economic governance, as well as fighting global warming. As much as transatlantic cohesion is necessary, it alone is not sufficient. The US and Europe should leverage stronger transatlantic ties to engage other countries, including those who behave like rivals, from a position of strength. This approach should guide transatlantic cooperation in critical regional contexts as well as on the global stage. Maintain a multi-tier approach towards Russia that combines the bolstering of defence and deterrence assets as well as diplomatic and economic sanctions, with engagement in high-level talks on ways to prevent uncontrolled escalation and re-create a more stable security environment in Europe. Coordinate efforts to address the multiple crises in North Africa, the Middle East, and the Gulf. In particular, the United States and its European allies should promote inclusive politics, isolate jihadist groups, and coordinate with rival powers. In the long term, they should pursue the creation of an inclusive security governance architecture involving Iran and the Sunni Arab states. Bring negotiations over the Transatlantic Trade and Investment Partnership to a successful conclusion. The agreement should be the basis for an open regionalism in which trade and investment practices enshrined in the treaty can be extended to other partners. Reduce the imbalance in voting rights in the international financial institutions and undertake a renewed effort to ensure that new financial bodies, such as the Chinese-led Asia Infrastructure Investment Bank, follow high-quality transparency and accountability standards. Intensify networks, including fortifying contacts between individual US states and EU countries, to exchange best practices on fighting climate change, as well as reaching out to countries such as China to gain the international consensus needed to push forward ambitious and verifiable targets in the aim of reducing polluting emissions. 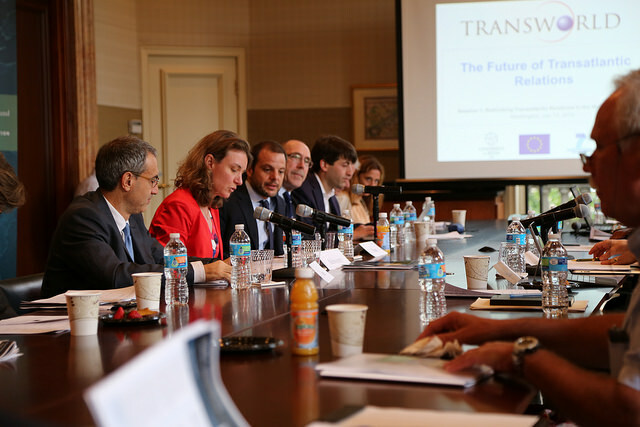 On Monday, July 13, 2015, the German Marshall Fund of the United States (GMF) and the Istituto Affari Internazionali (IAI) hosted a conference on the future of transatlantic relations and global governance, which constituted the culminating event of the Transworld project. The morning session featured an exchange with Transworld researchers and experts. 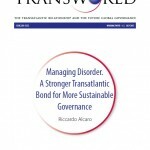 The afternoon session of the Transworld conference featured an exchange with policymakers and officials from both sides of the Atlantic. Over a period of three and a half years, Transworld was supported by the input of numerous experts and drew from 35 research papers, a survey and a Delphi exercise. In an elegant closing argument, Ambassador Grossman resolved that ultimately, both the US and Europe would have to get past “non-issues like bananas and chlorinated chicken,” which continued to define the public TTIP debate, if the transatlantic partners are to strengthen the transatlantic partnership going forward.